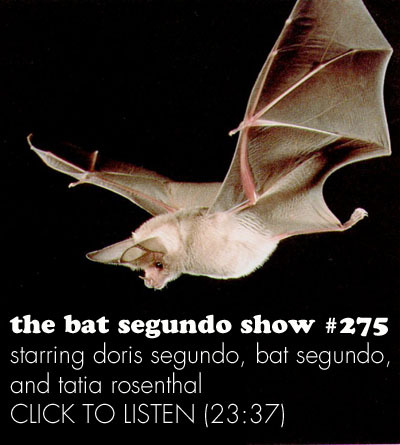 Tatia Rosenthal appeared on The Bat Segundo Show #275. 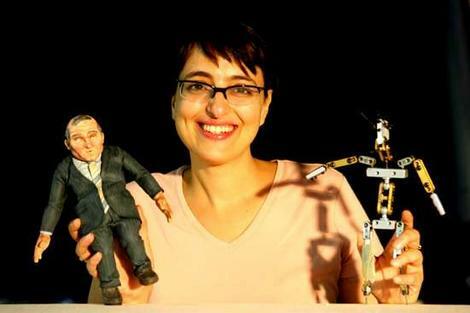 Tatia Rosenthal is is most recently the director of $9.99. The film is presently playing at the New Directors/New Films series, which is running between March 25 and April 5 at MOMA and the Film Society of Lincoln Center. It is also scheduled for limited release on June 17, 2009. Condition of Mr. Segundo: Ushering in an economic revolution. Subjects Discussed: Unintentionally defying the “good things come in threes” maxim, animating at two frames per movement, Bill Plympton, the aesthetic advantages of budget limitations, character proportions in relation to the sets, camera placement, a shared affinity for short lenses, immersing puppets in shadow, dealing with sweat in animation, animating natural elements, “A Buck’s Worth” as template for $9.99 (YouTube link), compositing vs. in-camera stop-motion animation, shrinking the Lilliputian puppets down in post, sticking to scale parameters, the look of the piggy bank, human mouths and animating Os, the problems of animating dialogue, whether animation must have fantastical elements to be “animation,” magical realism, animating eyes and blinking, breaking away from stereotypical body movement and defying cliches in animation, animating multiple characters in the Show and Tell scene, Anthony Elworthy, ambition, tracking shots, color coordination, self-help books, and graphical elements. Correspondent: The other thing I wanted to note is sweat in this film, and bodily fluids in general. Now we see sweat in a love scene late in the film and also in the elevator. However, going back to this question of lighting, I should point out that you lit this in such a way so it appears that the texture is sweating, even though it isn’t. So I’m wondering about how you dealt with this idea of actually having to put some sort of moisture on the puppets in order to get that sense of seat. And not only that. You also have to animate that as well. So I’m curious how this came about. Rosenthal: I think you’re going to be surprised by the answer. Did you like it? Rosenthal: Interesting. Because it was an accident. And we were doing our best to conceal the sweaty look. Because the silicone actually appears shiny and looks like sweat. The material that we used. And we were doing our damnedest to erase it with powders and stuff like that. And then some of it would get revealed. Because the animators were touching the puppets. And they looked like they gradually were sweating. And then when we got to post, what we did, when it was really distracting, we deleted it frame-by-frame. Rosenthal: Painstakingly. And the places where it stayed were the places where it felt appropriate to the scene. Like you’re remarking. So it was really sweating in reverse. Correspondent: Oh, but I like sweat! Characters should sweat. Puppets should sweat. Rosenthal: I like it now.